Happy Pioneer Day - July 24th! This stirring statue, on Temple Square, Salt Lake City, was sculpted by my mother's uncle, Torleif Knaphus. I've been drawn to pioneers since I was a little girl. I think I must have watched them from heaven, cheering them on and praying mightily for their success. Last night for Family Home Evening we watched 17 Miracles, a film about the Willie handcart company. Our hearts swelled with gratitude and love while our eyes leaked tears as we saw the portrayal of these pioneers. 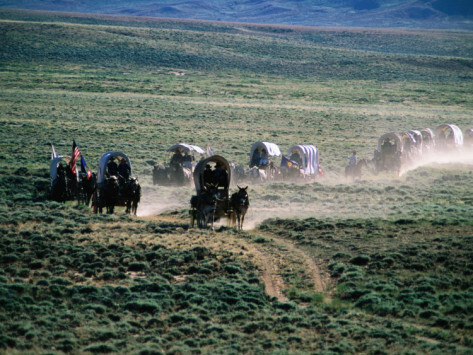 As far as I know, none of my ancestors crossed the plains in a covered wagon or handcart. They migrated later and rode on the train. But, I still claim the pioneers as mine. I love them for their faith, fortitude and perseverance. Although we can recreate the trek, down to the smallest physical detail, it is impossible to capture the feelings of those Mormon Pioneers, cast from their homes traveling to an unknown destination where all that awaited them was a whole lot of hard work. I'm so grateful they did it laying a firm foundation for our day. We are indebted to them and today is the day to our gratitude.